This is me, on a rant. We, as a country, have killed our food. And in the process, we are killing ourselves. Rosie wasn’t the only riveter! I’m not sure just how things went so far south as to how we handle and relate to our most elementary need: sustenance. Some people say it started when we went from hunter/gatherers to farmer/agriculture/manufacturing. Some people blame the WWII and then the women’s liberation movement for creating changes in women’s roles: going from the family food preparer, housekeeper and caregiver to the working women who were in desperate need of conveniences to help them juggle work, home and family. However it happened, I don’t like it. We’ve given away our power by trusting doctors, government (FDA and DOA), pharmaceutical companies, cereal companies, dog food companies, soda companies, energy drink companies, etc. as they tell us what we should eat, what we should do and what we should take to be healthy. We don’t even question them—we believe they are there to protect us, by law. We have given away our power, period. We don’t research how pharma companies pay for studies to make their products look safe, how they wine and dine medical professionals and have their check books deep into medical schools, how dog food companies and pet pharmas pay for vets’ education, continuing education and more. We don’t realize how many studies are faulty, slanted or flat-out falsified. How factory farmed food animals (FFFA) are mistreated, abused and genetically altered to make the biggest profits, given antibiotics to compensate for their compromised immune systems from overcrowded living conditions, fed by-products from other industries because they’re cheap and easy to get and fatten animals up quickly. We rarely think about how we eat what we eat eats. Read that slowly, it does make sense. Really. All the unnatural foods fed to FFFAs end up in their meat, which we consume. FFFAs have a serious imbalance in Omega 3’s because they’re not eating the pasture grasses for which their bodies were designed. That’s why everyone is gulping down Omega 3 fish oil capsules! But then, where do those capsules come from? If it’s farmed fish, they too are being fed garbage. Soy, corn meal, chicken and pig feces (yes really), canola oil, dyes, arsenic and… antibiotics. With loads of PCB and other chemicals thrown in just for fun. And really, do any of us want animals of any kind to suffer? Think you can wash pesticides off? I’m not just talking about animals. Vegetable, nut, fruit, grain and fruit farms are being over-farmed due to zero crop rotation. The soils become deficient in vitamins, minerals, healthy bacteria and nutrients— and so are the crops they produce. To make up for the lack of nutrients in soil, they are being sprayed with chemical fertilizers. Don’t get me started on Monsanto, but they are genetically modifying seeds (GMOs) so they are “Roundup ready.” You know Roundup, the stuff you spray on weeds and “they won’t come back?” Well, weeds become a problem on farms as well, competing with the food crops for water, space and nutrition. The quickest, cheapest and easiest way to deal with them is to spray with Roundup.The genetically modified plants can withstand the barrage of herbicides while the weeds die. The food plants soak up Roundup like Kool-Aid. Think that stuff can be washed off? Then they sell you more chemicals in a spray bottle to “wash off” the pesticides. Right. So once again we’re eating foods that are nutritionally deficient and loaded with poisonous chemicals. Yum. And then there’s the dry and canned convenience foods. Ever read the labels? All the nutrients have been removed by processing, sterilizing and preserving. Any of the “good” bacteria found in raw milk and milk products, pickled foods and preserved foods have been killed off by heat processing and chemical preservatives. That’s why there are so many of those probiotic commercials! Food in boxes comes with labels almost completely written in chemistry. No more MSG? Look again, it’s been renamed to hydrolyzed protein, just one of 50 names to throw us off the trail. Loads of flavor enhancers and lab-created vitamins to make up for dead food, preservatives to keep an infinite shelf-life (but they add expiration dates so we will throw out unused products and buy more). Is it any wonder that people are sicker than ever? More cancer, more autoimmune diseases, more allergies, asthma, GI problems, heart disease, gluten intolerance, mystery illnesses. Autoimmune Disease, The Cause and The Cure by Annesse Brockley and Kristin Urdiales. Even if you don’t suffer from an autoimmune disease per se, the detailed information in this book will explain a lot of what’s going on in your body and WHY. Take your power back — Ten easy ways to get started! 1. Read labels. Try to get an idea of what’s in the food you’re buying and what it will do to your body. Many of the chemicals found in personal care products, laundry products, air fresheners and household cleaners are known carcinogens. (AI, pg 196) Environmental Working Group ranks over 15,000 brand-name products and has loads of information on what’s in other things we are exposed to or consume. 2. Get educated. Read more books like Nourishing Traditions (a cook book but first and foremost a WEALTH of information) and Autoimmune Disease, The Cause and The Cure. Follow Annesse and Kristin on Facebook, they are always updating with new information and responding to people’s questions. Join the Weston Price Foundation and subscribe to the newsletter. Watch some YouTube videos by Dr. Ken Berry and buy his book. Natural only means it’s not from another planet. 3. Know where your food is coming from! Again, read labels. Is it organic, certified organic or “natural.” Any GMOs? Are the chickens “cage free” or “free range?” Terminology regarding food can be deliberately misleading. Is the meat pastured and grass finished? Learn the differences and how truthful agriculture really has to be under our lenient and misleading labeling laws. Pay more attention to the way your food is being raised and processed. You’ll be eating what they eat, animal or plant. The ideal solution would be buy from local farmers and see their farming and animal treatment practices in person. There are resources on the internet for finding raw milk, organic produce and pasture-fed animals. 4. Be willing to spend more money on organic fruits and vegetables, grass-fed free-range meats, dairy and eggs. You can start gradually. It is SO worth it. And pay attention to grass-fed meats vs. grass-finished. Ranchers will finish cattle and other animals off in feed lots being fed garbage to fatten them up before going to market, which drops the quality of the meats. Don’t be fooled by that, you want pasture-raised, pasture-FINISHED meats. 5. Start a garden. I realize it’s not possible under all situations, but you can even start small and grow herbs indoors and tomatoes and other patio vegetables in planters on a porch or balcony. I currently have a potted garden in my second story guest bedroom and it’s doing great! A lot of neighborhoods have community gardens where for a small fee you get a little plot of land and can spend time tilling the earth, getting close to nature and meeting new friends. Another way would be to volunteer at a local organic farm and get fresh, healthy food for trade. 6. Question authority. Is there a special interest group (soy growers, corn growers, sugar growers, pork growers “the other white meat”, high profit industries, chemical manufacturers, ad nauseam, their marketing budgets and lobbyists) behind what you’re being told? Honestly, no one is interested in taking care of you and your health other than you and possibly your family and friends. If there’s a profit involved, you can be assured there’s corruption, deceit and greed. No, I’m not a conspiracy theorist. I just read a lot. 7. Take up a new hobby such as canning your own foods (or foods from farmers’ markets), culturing vegetables and dairy, cooking more meals from scratch. Get the whole family involved. It’s so easy to make your own salad dressings (and mixes), rice seasonings, sauces and gravies, marinades and rubs, mashed potatoes and more from wholesome and organic herbs, meats and vegetables. 8. Research cooking oil options, butter and animals fats—I guarantee you’ll dump the vegetable oils in a heartbeat. 9. Ditch the cans of soup, stews and chili. If you’re making soup, stew or chili, make some extra and freeze it in freezer-safe canning jars. Stay away from processed foods, avoid all canned food (as in cans, glass jars are better) and opt for frozen foods at the very least. As far as fruits and vegetables go, the frozen ones were frozen at their peak of ripeness and have not been heat processed to death. Check for preservatives! Why don’t we listen to him? 10. Learn the truth about chemically manufactured table salt vs. sea salt, what’s wrong with boxed cereals, crackers, MSG, raw vs. pasteurized milk, margarine vs. butter. I could go on and on. Here’s a paper written by the Nourishing Traditions author Sally Fallon to get you started, Dirty Secrets of the Food Processing Industry. It will shock and disgust you when you read about what we have been unknowingly eating, and it’s just the tip of the iceberg. Our food has ceased be safe and nutritious as commercial food providers have slowly seduced us into being dependent on them. I’ve learned so much about how we’ve learned to trust industry and government agencies, pharmaceutical and agricultural interests, thinking that they know what’s good for our bodies. We’ve been taught that we should fear handling food prep ourselves because of all the things that can “go wrong” when a layperson tries to grow, preserve and even cook their own food! This entry was posted in American diet, autoimmune disease, cooking oils, disease, factory farming, flouride, gardening, hidden MSG, lack of nutrition, nutrition, organic foods, pasture fed animals, roundup, why are americans so sick on February 16, 2014 by Farmer Deb. 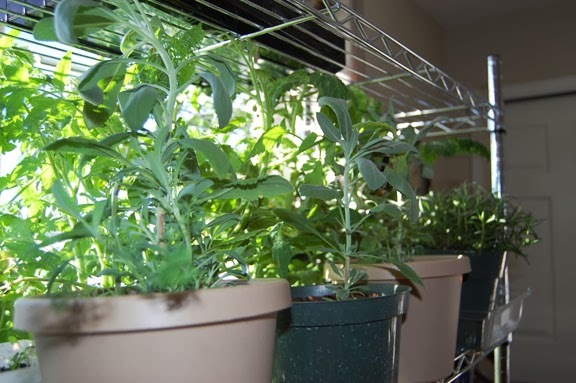 Indoor gardening — Is it feasible for the average home owner? What do urban farmers do in the winter, when they can’t get their hands on decent tasting tomatoes and herbs? When their green thumbs long for gardens during long, cold, snowy winters? When they get tired of paying a fortune for fresh organic produce that doesn’t taste any better than the rest of the produce in the store? This urban farmer brings the garden indoors. For years I’ve successfully started my outdoor garden from seeds germinated indoors, weeks ahead of time. A couple of years ago I bought this amazing LED grow light that made my seedlings flourish like never before. 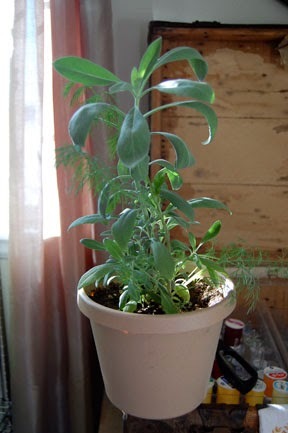 The first winter I bought it I tried growing a number of veggies and herbs, not intending to keep them very long. I was just curious how they’d do. But a few weeks under the light gave me fully edible chard, collards, parsley, basil and other herbs. The tomato plants had a little tomatoes on them and the green beans had miniature beans growing. I was impressed! This fall I decided it would be a fun experiment to try to make it through the entire winter growing tomatoes and herbs indoors. I wish I’d started earlier, like maybe in September. But I didn’t get things planted until after Thanksgiving. I started with the typical little plastic seed packs and seed starter mix. One each of three different types of tomatoes: Costoluto Genovese, Brandywine and Roma. Some basil, dill, parsley, oregano and sage. Rosemary from the store. I also started some white sage, which I never had luck germinating previously. Once the seeds sprouted, I moved them to the window in the guest bedroom. It’s south-facing so it gets a lot of our hot Colorado winter sun. It’s also the warmest and most temperature place in the house. I hung the grow light over the plants using a light stand with a boom arm. The light was just under 12″ from the plants. I plugged the light into a timer– one less thing to think about. Within about 3 weeks the plants were outgrowing that space. I moved the guest room furniture to a different room to make more space. I bought this great stainless rack at target and placed it front of the window. Since the shelves are very adjustable, I gave the now overgrown tomatoes a shelf to themselves, with a short shelf above them for the herbs. The grow light sits on yet another shelf above that. I position the herbs in a way that the tomatoes below them can still get light from the LED and everyone is happy. In the beginning I was only running the grow light from 4 pm (sunset) until 10 pm. But the plants weren’t looking as healthy as they should. They weren’t the deep green I wanted and some were getting a little spindly. A happy plant will look strong and stocky. So I increased grow light time until midnight. That, plus the slightly longer daylight since we’re past the solstice has made a big improvement. I added a cool temp humidifier, although I’m not sure I need it. On sunny days I swear it gets close to 90 in there! I found a variegated lemon tree at the grocery store and that’s now producing new leaves. Let’s see if I can keep it alive. I’ve been using the herbs for cooking almost every day. 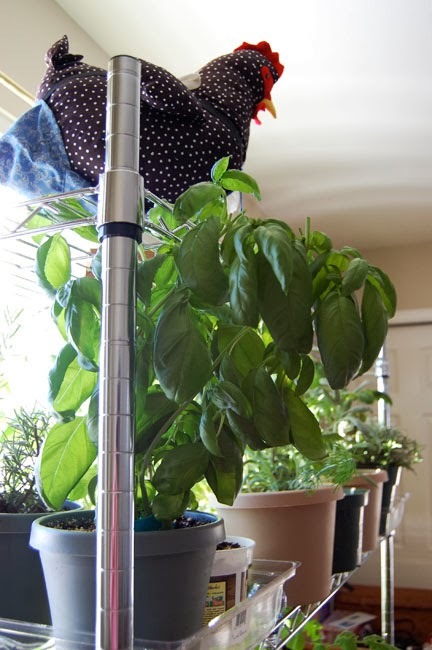 The basil especially impresses me since I think of them needing a lot of light in the garden, but they look perfectly normal indoors. The tomatoes have little fruits on them and I’m curious if they’ll get large enough to ripen. And how long might that take? If they’re still around in late May, I will most likely introduce them to the outdoors. I’m also curious if they will taste better than store-bought tomatoes. 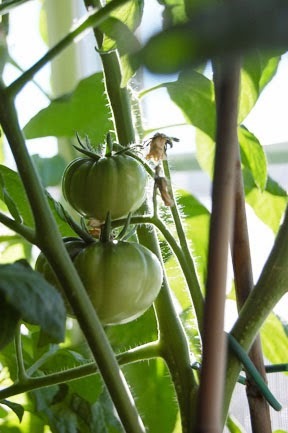 If they don’t, I’ll ditch my goal of growing tomatoes indoors in the winter and just stick to herbs. After all, why buy those teeny $4.00 packets of herb snippets in the grocery store when it’s so easy to grow my own for the cost of one seed? If the tomatoes are a success, I’ll keep better records next year on plant dates, grow time and even photograph them weekly to have a clearer idea of how they’re doing. It’s now early February. I’ll update this post at some point to let you know how things are getting along. Wish me luck! 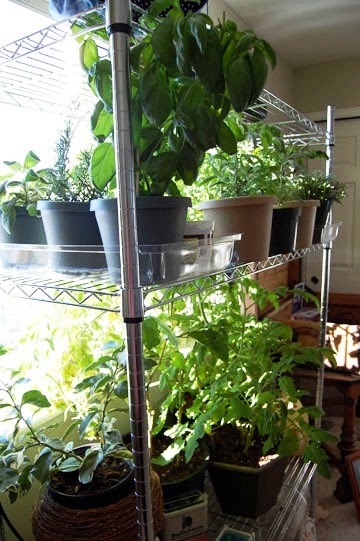 This entry was posted in Great grow lights, growing herbs indoors, growing lemons indoors, growing tomatoes indoors, growing white sage, indoor garden, indoor gardening, indoor herb garden, starting seeds indoors on February 3, 2014 by Farmer Deb.